On Mike & Jill McCormick's property lies a farmhouse built in the 1880's. When the McCormick's originally bought the land, it was disclosed to them that a teenager had died in the farmhouse. Soon after, the owners reported hearing strange sounds and items being moved during renovation of the house. In 2004, a psychic was brought in and she confirmed that there indeed was paranormal activity going on in the house. The McCormick's decided to convert the farmhouse into a real "haunted house" that everyone could enjoy. The Haunted Hollow Haunted Theme Park is now known as one of Omaha's best Halloween attractions. PRISM conducted several investigations in 2006 and was able to capture several eerie EVPs and photographs, once again confirming that the house was truly haunted. 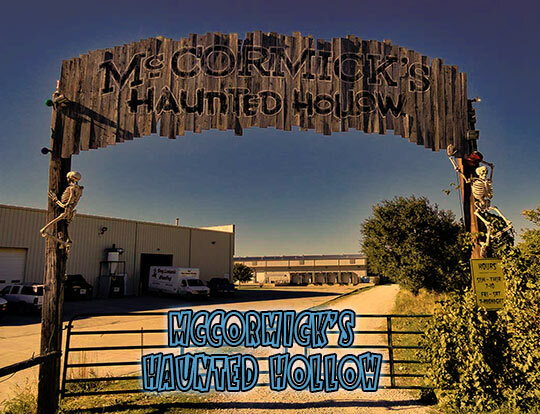 The farmhouse was to be torn down, but after the hearing these EVPs, the McCormick's decided to keep the house intact and to keep the well-known Omaha Halloween attraction going. PRISM hopes to continue investigating this hotbed of paranormal activity in 2014 and for years to come. This is video from PRISM's investigation at Haunted Hollow in LaVista, Nebraska on October 10, 2015..
PRISM investigated the farm house again on October 21, 2013. PRISM investigators present were Carl, Bo, Kelley, Lisa, Nichole, Michael, and Cassie. Also present were four contest winners from Q98.5 radio station giveaway, two 2013 UNO Paranormal Summit winners, plus Joe, Gabby, and Junior from Haunted Hollow. Several EVP were recorded. This EVP was captured by PRISM investgator Mike Beacom on a digital audio recorders on the basement bridge of Haunted Hollow at 11:50pm. PRISM investigator Cassie Beacom says, "Is it OK that we're here? ", followed by the EVP. The EVP below was recorded on PRISM investgator Nichole Crockett's digital audio recorder in the Library Room of Haunted Hollow at 12:45am while PRISM Director Carl Norgard was alone in the room. Carl can be heard asking, "...or do you hide in the corners? ", immediately followed by the EVP, what appears to be 2 separate male voices speaking over eachother. The EVP below is of a whistling sound was recorded in the Hunter Room (formerly known as the Mausoleum Room) at 12:45am. PRISM investigator Kelley Kennedy says, "Can you come in and say hi?". A mysterious whistle noise is then heard, followd by Gabby from Haunted Hollow saying, "Grandpa's here. Hi Grandpa". The EVP below was recorded by PRISM investgator Nichole Crockett on a digital audio recorder in the Library Room of Haunted Hollow at 11:50pm. An EVP is heard immediately before a PRISM investigator says, "I think we're done". Below is a short Haunted Hollow radio promo that aired in October 2006 featuring several of PRISM's EVPs from our investigation of the farmhouse. Photo credits Carl Norgard and David Pierce Rodriguez. PRISM was the first paranormal team to investigate this spooky farmhouse in September of 2006. David Pierce Rodriguez, Carl Norgard, Dottie Norgard, Kelley Norgard, Bo Kennedy, Trevor Redmond, Dan Christianson, & John Shrimpton. Many very clear EVPs were recorded during the 2006 investigations. These incredible EVPs can be heard in the video below.